I love your cute hat, it is quite turban like. Your family have such a good eye for beautiful things. Great show reviews too, Osman is a favourtie of mine. Lovely photos taken by the lovely Dvora. She's taken some great shots from all of the fashion weeks. 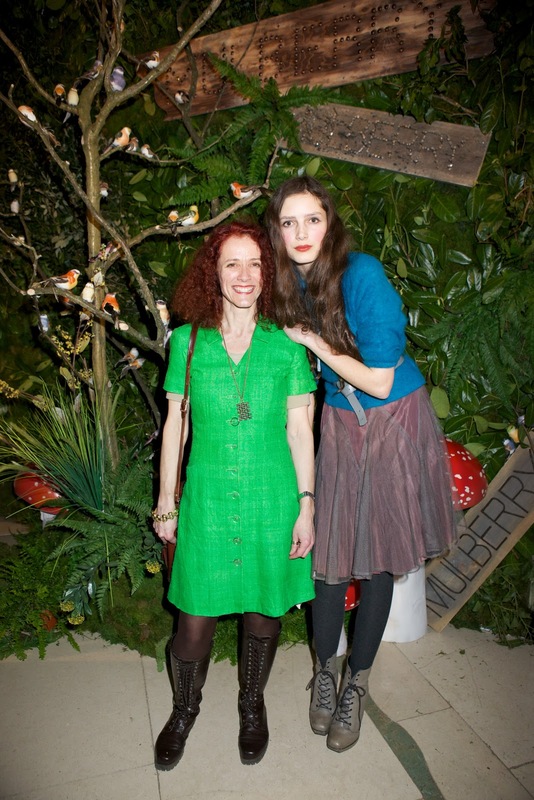 The shot of you and your mum made me think instantly of Alice in Wonderland, perhaps because of you height. You look incredible. Great show reviews. I love how Osmans cape reminded you of the Louboutin sole, it's the little details like that that makes things so special. How can you always be that cute?? Beautiful, beautiful, Roz. The angora is such a nice and soft touch, I really like it a lot. The pin is very unique as well. It looks like you've had an amazing time: I'm actually quite envious! ^^, Hope you are well, sweetie! Gorgeous colours! Your blog is so inspiring! Love the brooch on the hat! Very Pretty, I love the makeup in the second photo Very simple yet beautiful. I love the bright blue. Fab. You looked gorgeous. That must have been such an amazing experience. I've never been to a fashion show so for me it would be amazing. Wow great photos..i love your style its so quirky and sophisticated. 100% love every part of this post! You are so, so beautiful! The photos are gorgeous. You are such a doll! Especially adore your grandma's angora knit. Glad you had so much spontaneous fun at LFW! Love the outfit! That blue would have to be my favourite! Electric blue is a favourite of mine at the moment too and the mohair looks lovely and warm for London in February. "sashay through a misty city" = beautifully phrased Roz, I know exactly what you mean! I'm sure that you fitted right in with all of the "creatively dressed people" - you look it! Wow, you look so beautiful. That blue is amazing, and i like the bag, even though it's not much visible. 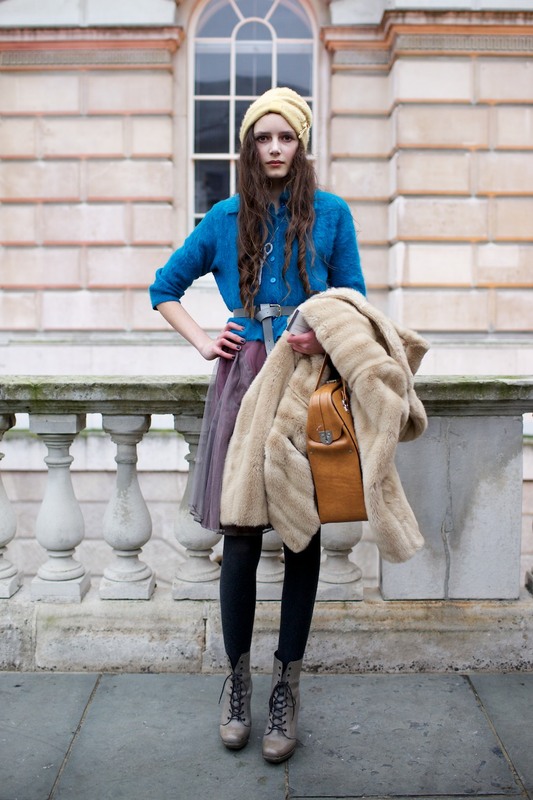 Another effortlessly cool outfit - you look great in that sharp electric blue. Nothing like some vintage styling to create an original style. You look cute and lovely as always! Love the colours in your outfits as well as the different textures! your face just looks gorgeous and i love your hat and the whole color ensemble! The cardi is gorgeous and blue suits you so much! beautiful jumper, it looks so soft! I love the flowing skirt and the shimmering colour of it. I love that underskirt, and it works so well with the blue jumper! you look stunning! 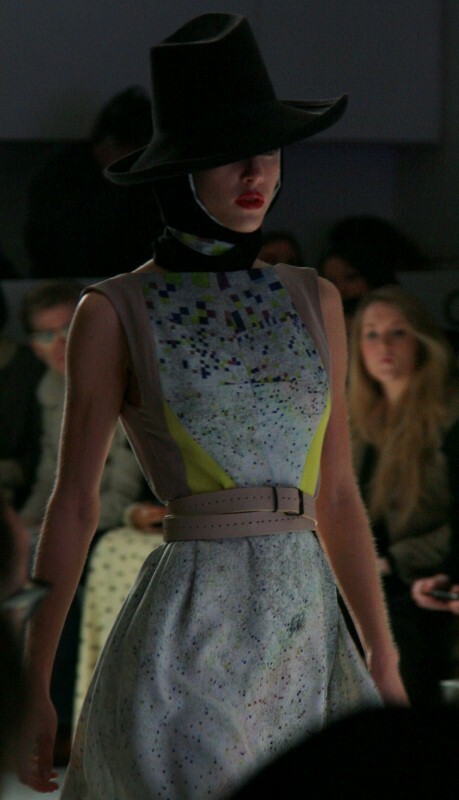 how fun to be a part of London Fashion Week! Loving your tan bag - sooo cute! OMG! You're so beautiful! Despite of you live in a small village, your style is so amazing. I'm watching your blog a couple of time and I think that I'm in love with your beauty and style. I adore this atmosphere of forests and English villages! Thank you for huge inspiration! I love how you combined electric blue with yellow. And your make-up is gorgeous! You are daring now with high heel boots. How fantastic is that???? I can see the mummy sccissors. How many people made them in the end???? Blue love you, and so do I. Have a superb weekend my dear Roz. I really like the range of tactility in this outfit. Whenever I wear fur or fuzz I always find myself stroking it completely unaware of how odd I look until I notice somebody staring! But that's just me. I know cinemtography is just divine. Have you seen stealing beauty? The cinematography in that makes me want to jet off to Tuscany whenever I watch it. And I really like the faded canvas and florals in Armani's costume design even though i am not really a fan of his. Yes i have read the Great Gatsby, at the moment I'm on a Fitzgerald spree working through every story I can find. Have you seen Mia Farrow and Robert Redford in the Great Gatsby? It seems like the kind of thing that you would enjoy. This IS the post the sums up why you and this blog are one of my faves of faves- the styling, the great photographing, the sweet humanity and the FASHION. I love those street style shots of you- and if I hadn't "met" you already I would so make you my new hero for the way you make vintage singingly modern and relevant. You are such a vision of beauty, and the sweet soul pinned beneath those model good looks drives it home and it puts it to bed. GORGEOUS. And speaking of: I love seeing a pic of your mum! Hi mama of Roz! You are such a beauty too! Wow, gorgeous. I love all the fur items - you styled it beautifully. lovely outfit! definitely love he blue and yellow combo, and it really works on you:) ps, you and your mom look so cute! Such a super chic look hun! From the fabulous shot of electric blue to the mustard tote...Fresh and fun, perfect transitional outfif for spring! You look stunning as always! I absolutely love these photographs, they came out fantastic. nice photos and reviews from the shows- how exciting for you!